One of the reasons why people are attracted to football is due to just how exciting and high-octane the sport can be at times. From long-range goals to 5-0 thrashings and 30-pass moves that end up with the forward tapping home, football has a whole variety of ways to keep fans encapsulated for a lifetime. However, the aspect of football that is surely the most exciting is comebacks. Whether it be two last-minute goals to win a cup final, or being 4-0 down a scraping a draw with a last-minute pile-driver, there are some comebacks that have been, and are going to be, talked about for years to come. One of the most memorable European nights as Liverpool came from 3-0 down at half time against heavy favourites AC Milan to claw it back to 3-3. Carlo Ancelotti’s side had such an easy time of things in the first half as goals from Paolo Maldini and Hernan Crespo tore Liverpool to shreds – one can almost forgive them for thinking the second half would be a breeze and the trophy was already theirs. However, they were made to pay for writing Liverpool off, and Steven Gerrard’s header early in the second half gave the Reds what looked at the time just to be the faintest glimmer of hope. Two minutes later, however, Vladimir Smicer scored a second to really signal that Rafael Benitez’s men were back in business. Milan clearly couldn’t handle the pressure and conceded a penalty just four minutes later, which Xabi Alonso tucked home at the second attempt. Liverpool then won it on penalties after a thrilling 3-3 draw to complete an incredible comeback in the biggest of games. Despite being relegated to the Segunda Division in Spain very recently, and battling for mid-table mediocrity before that, there once was a time when Deportivo were renowned as the best team in Spain. The club managed to win La Liga in the 1999/2000 season, with stars such as Roy Makaay and Pauleta helping the Spanish side finish above the likes of Real Madrid, Barcelona and Valencia on their way to the title. A few years on, they were battling it out with some of the world’s biggest clubs in the Champions League, and that’s where the next comeback on our list comes in. Having been 4-1 down from the first leg against AC Milan thanks to goals from Kaka, Andriy Shevchenko and Pirlo, it seemed like Deportivo were as good as out going into the return leg at the Estadio Raizor. However, what happened next was a match that has gone down in European cup folklore. Having pulled the scored back to 4-2 on aggregate within five minutes of the second leg kicking off thanks to a strike from Walter Pandiani, Deportivo soon found themselves 3-0 up at half time following goals from Juan Valeron and Albert Luque. Then, with just 15 minutes left on the clock, Spanish international Fran scored a goal that ended up capping off the greatest comeback the Champions League had seen to date. Next up on our list is yet another one which most fans probably wouldn’t have heard of unless they are supporters of either side. In the 1985/86 UEFA Cup third round, Spanish giants Real Madrid shockingly pulled off a remarkable second-leg comeback to beat Monchengladbach to advance into the quarter finals. Having found themselves 5-1 down from the first leg in Borussia, Real travelled back to the Spanish capital knowing that a 4-0 win would be enough to put them through, and that’s exactly what happened. A brace each from Jorge Valdano and Santillana, with the last goal coming in the 88th minute, saw Los Blancos go through to the next round on away goals in a two-legged affair that is one of the most enthralling and dramatic in the competitions history. Now here’s a comeback that we know almost all of you know would’ve heard of, and some may have even watched with it being that recent. 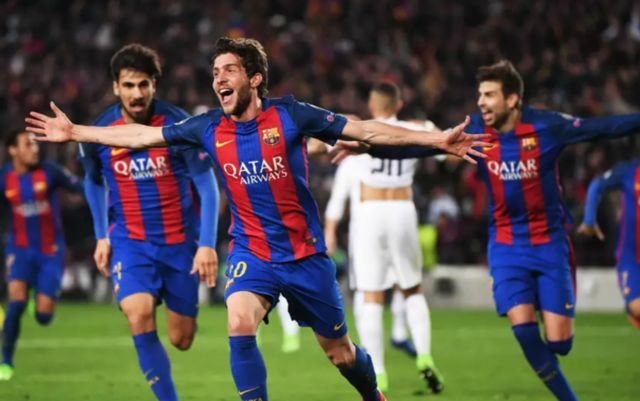 In the 2016/17 Champions League round of 16, Barcelona were drawn against French giants PSG, as the Blaugrana were looking to become the first side to win the Champions League five times since its rebranding in 1992. These hopes were dashed after the first 90 minutes in Paris, as goals from Angel Di Maria, Edinson Cavani and Julian Draxler saw Laurant Blanc’s side travel to the Nou Camp in full belief that they had basically secured their place in the quarter finals. However not even the most optimistic of Barcelona fans would’ve predicted what happened next. A Neymar-inspired Luis Enrique side managed to pull off the unthinkable and win 6-1, as the became the first team ever to overturn a 4-0 deficit in a Champions League knockout tie. A brace from the Brazilian, as well as goals from Lionel Messi, Luis Suarez and an own goal from Leyvin Kurzawa saw the Spanish giants take a 5-1 lead going into added time, with Barca still needing one goal to advance seeing as PSG had a crucial away goal. The Spanish international’s goal, which came from a fantastic ball into the box from Neymar, gave Barca the 6-1 lead they needed to knock PSG out, and secure the one of the greatest comebacks in football history. Truly breathtaking. Now for a match on a list of the greatest comebacks of all time, this scoreline seems quite low, however it’s the sheer drama and circumstance of this affair which sees it claim a spot on our list. Man United found themselves 1-0 down thanks to a sixth-minute goal from Mario Basler, with time running out for the Red Devils to find themselves a route back into the match. Bayern had managed to stop numerous attempts from Sir Alex Ferguson’s side as the clock ticked towards the 90 minute mark, but all that perseverance from Bayern didn’t manage to stop United producing the best comeback the Champions League final has ever seen. Teddy Sheringham’s 91st minute strike saw the Premier League side tie up the scores with 1-1, with the ‘baby-faced assassin’ Ole Gunnar Solskjaer then tapping home a 93rd minute goal to put United 2-1 up, and eventually, secure them their first-ever Champions League crown. Unthinkable.